(Newser) – Solid gains in technology, industrial, and banking stocks sent US indexes higher again on Wall Street. 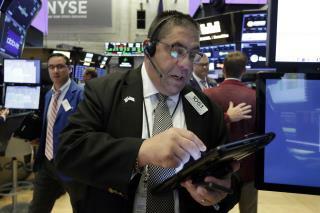 The Dow Jones Industrial Average rose 126 points, or 0.5%, to 25,628 per the AP. The Nasdaq composite climbed 23 points, or 0.3%, to 7,883, and the S&P 500 index rose 8 points, or 0.3%, to 2,858. Investors were encouraged by more strong quarterly results from US companies. Hertz, for example, soared 24.6% after reporting a loss that was far smaller than analysts were expecting. Also of note, Google's parent company, Alphabet, rose 1.5% on Tuesday. Oh. The horrors. Must find some reason to be upset. YEE HAA! Ya all know what time it is? That's right! It's the Happy Happy Joy Joy song! Singers: Happy Happy Joy Joy Happy Happy Joy Joy Happy Happy Joy Joy Happy Happy Joy Joy Happy Happy Joy Joy Happy Happy Joy Joy Happy Happy Joy Joy Joy ~MetroLyrics.com Do I see another UPTICK tomorrow? Yes! & Have a nice day on that note. Fake News! Trump has been shadow-prez since 2008. He had us at 5% GDP growth by January 20th of 2009. It was just the Deep State pretended we were in recession to give the black guy a chance. Cause the Deep State is all about black people. This we know.